The T-Con is a nicely designed figure. It has so much personality already that it doesn't immediately beg to be customised. When I was asked to exhibit at the show, I had a few fun ideas that kept the original design intact but eventually decided on a more drastic approach. When I inverted T-Con, I noticed that his body suggested the bulbous head of a 50's alien; something like the creatures from Invasion of the Saucer Men, with maybe a hint of Mars Attacks. The first task was to amputate all of T-Con's limbs and cover the resulting holes. I had a clear concept in mind for the feel of the piece but the idea was very much three dimensional and I had trouble rendering it with pencil sketches. Instead, I began 'sketching' the form using wire. This method lets me lock down the shape I want and also gives me the core of the armature needed to support the sculpt. 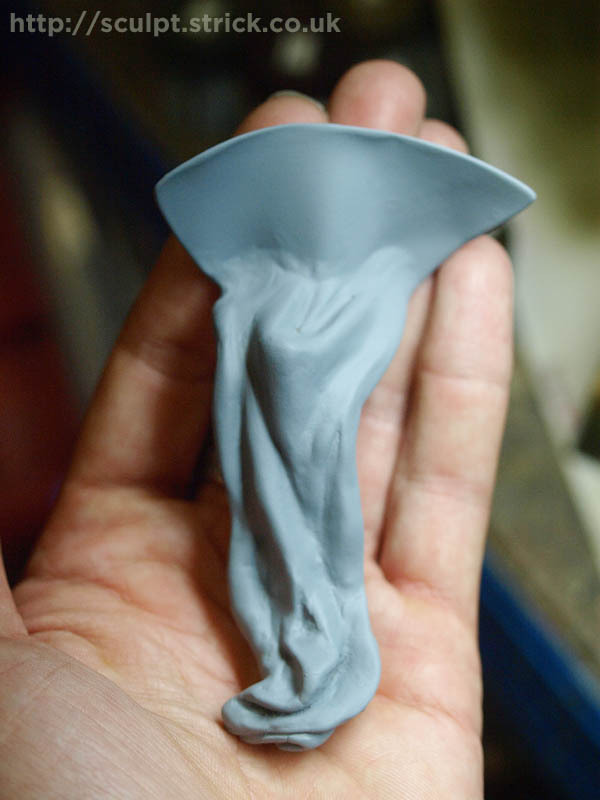 One problem with this technique is that the armature can end up too close to the surface on the finished sculpt meaning that it can be hard to carve recessed details and that the clay structure can be a bit thin and fragile in places. It also means that a lot of the sculpture is created in single piece, which can be awkward for sculpting details and for painting. The body was sculpted in Milliput directly over my wire armature. 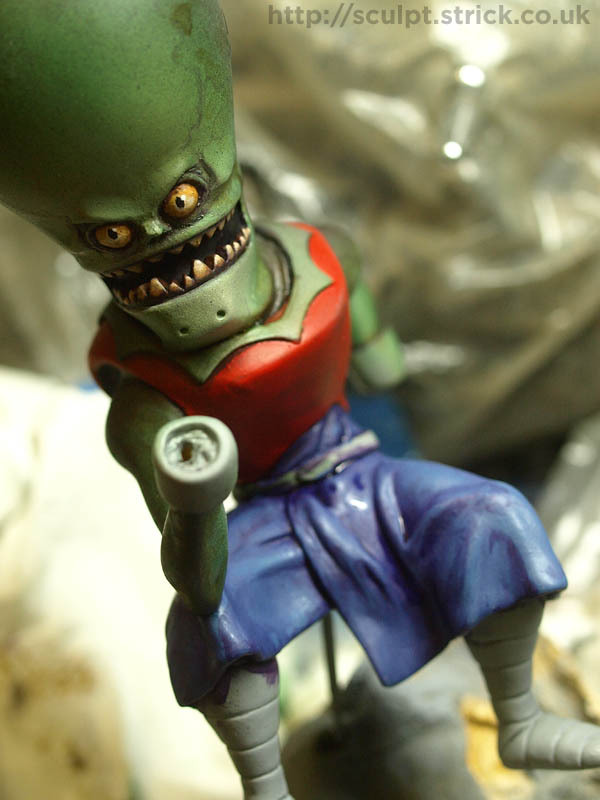 The segmented leg armour was inspired by Dan Dare's enemies, the Treens. The star-shaped collar was loosely based on Flash Gordon. I built the chair from acrylic sheet. I wanted something that would suggest both a pilot's seat and a throne. It also needed to be fairly simple so as not to dominate the finished piece. I tried to reflect T-Con's curve in the base of the chair to help tie all the elements together. I had bought a pack of polystyrene spheres that were the right size for the globe that my alien was to be holding. Unfortunately, they turned out not to be very spherical. It took a layer of Milliput and a lot of sanding to get something approximating round. When I was satisfied with the rest of the build, I cut off the wire representing the hands and drilled holes in the wrists to accept pegs. The joins would be concealed by his wrist bands. 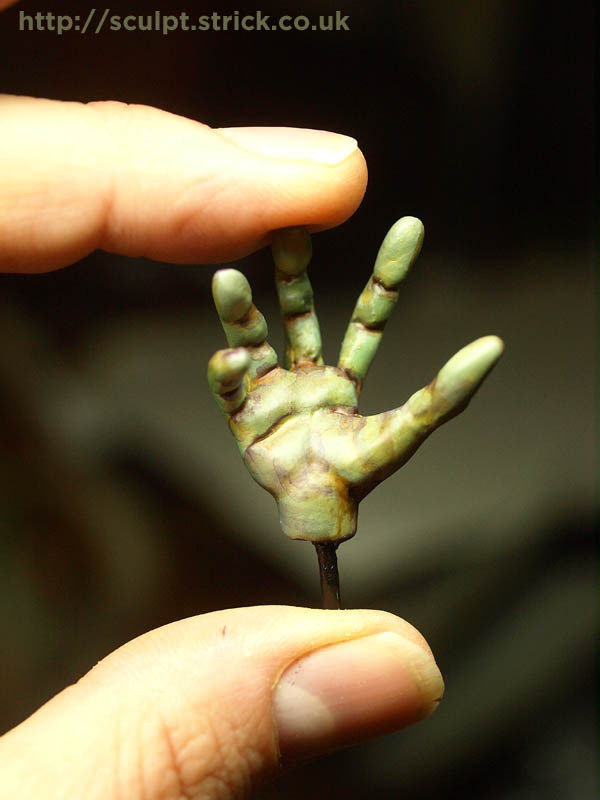 I then sculpted and painted the hands separately which made them much easier to manipulate. It also meant that they did not get in the way when detailing the rest of the figure. With all the additions and amputations, I felt that I needed to keep what remained of the original T-Con as recognisable as possible so I kept further physical changes to a minimum, sculpting a simple face and adding some veining inspired by the Saucer Men and by the Metaluna Mutant from This Island Earth. I heat-formed the collar of the 'Ming the Merciless' cape from sheet styrene and sculpted the rest in Milliput. The seat was painted with a slightly worn metal look. I kept the colour fairly muted so that it would not overshadow the figure and would look slightly military. The overall paint scheme needed to have some bold colours to define what had turned out to be quite a complex shape. I also hoped to suggest that the face was being lit by a slight glow from the globe. 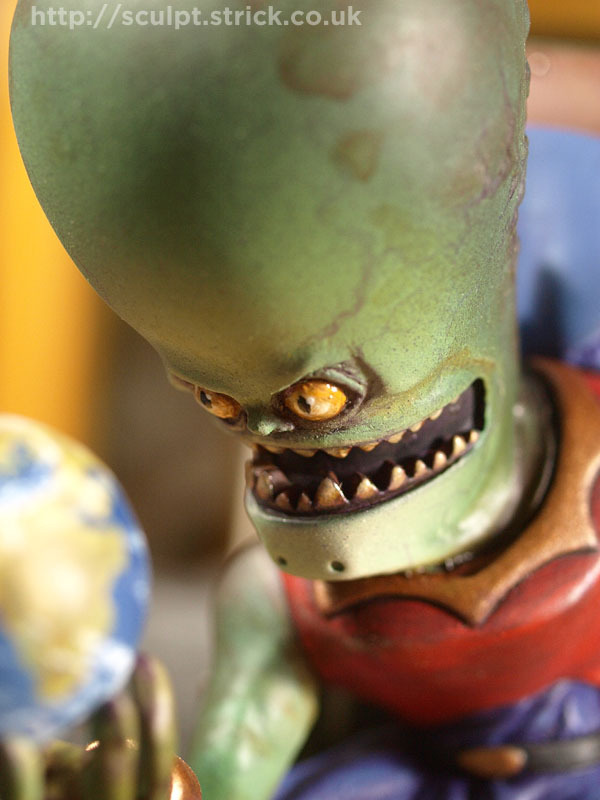 However, I wanted to keep the colours fairly naturalistic - tricky with a cartoony, green-skinned alien. It's a fine line to walk when muting colours to avoid making them muddy and dull. I used a variety of techniques to build up depth of colour and detail.